You are a Conservative Libertarian. You believe that government should leave business alone by having little to no regulation. You also believe that the people should have the right to make their own decisions, free from governmental control. 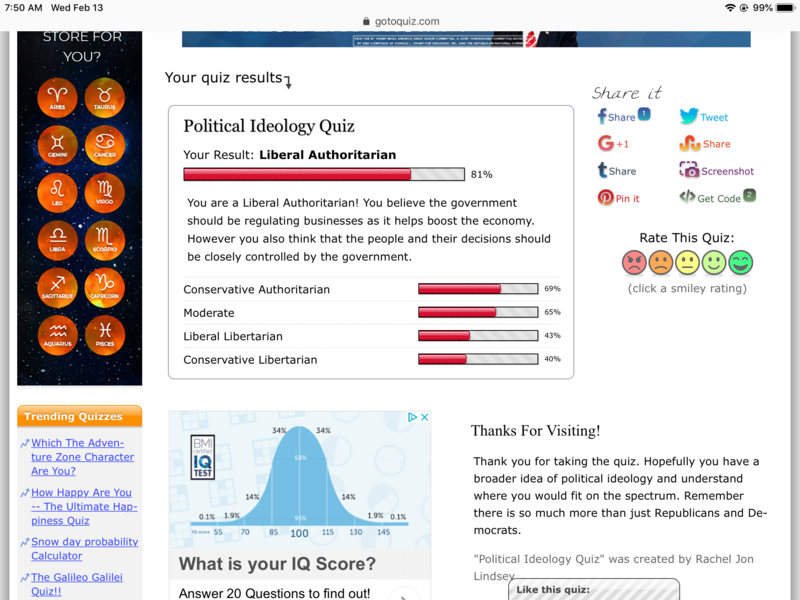 I am not sure what "Liberal Authoritarian" means; it seems to be an oxymoron. I am also not sure what my position has to do with conservatism, since my ideal system has never really been tried anywhere, and even the Founding Fathers' intended system is pretty far away from it. Regardless, the general description is right. You believe the government should be regulating businesses as it helps boost the economy. You also believe that the people should have the right to make their own decisions, free from governmental control. I guess I just find myself a whole lot more uncertain on some of these answers than the rest of you. I can see many of these issues swinging both ways. I guess that's why I often find myself in agreement with people from all walks of life. 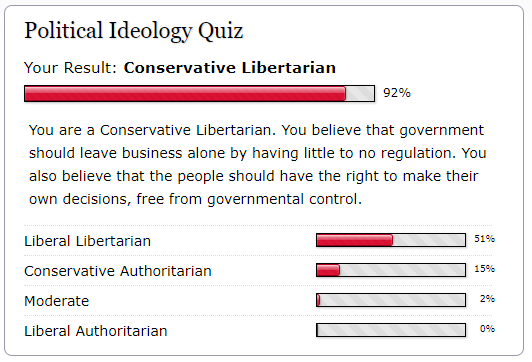 Generally agree with the liberal libertarian being the greater part of me, though. I concur, as a lot of questions are strongly dependent on the context. The way I usually answer these questions is by trying to figure out which answers the author expected from people of given political leanings, and choosing the one that matches mine. For example, take the question: "Smoking is harmful for the society, and some steps should be taken to eradicate it. Do you agree with it?". I agree with this statement - but the author's assumption is that agreeing with it implies that you support the state taking forceful measures to reduce smoking. While in actuality, I think that it should happen naturally, as the society evolves and people become more self-aware. People should peacefully support and encourage others to cure their addiction, but the state should stay out of it. So in this case I will choose "Disagree", even though, strictly speaking, this is not true. But objectively, indeed, almost every single question would be best answered with "It depends". "Do you believe that research should be done internationally?" Yes and no. 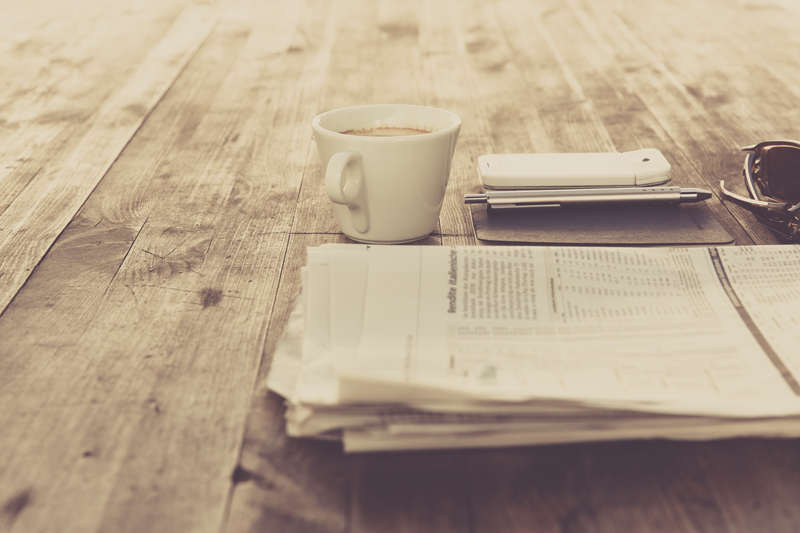 Research should be done both domestically and internationally, there is no dichotomy here. That's an intriguing way to handle it. I guess my only concern is over-interpreting the meaning behind a given issue. 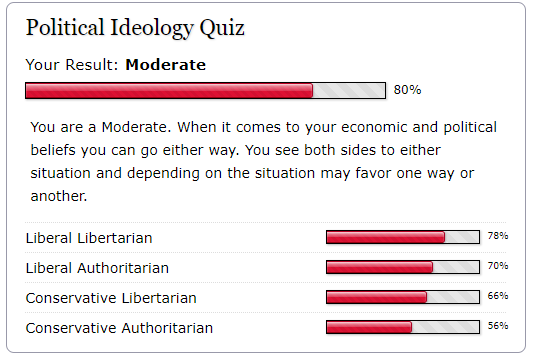 I suppose if we assume that each question is specifically posed to slot you into a given ideology, then that seems entirely accurate, and that would seem to be the purpose of a quiz like this. At the same time, maybe there's a bit of an effort here to do another form of delineation: between black-and-white thinkers and those who fall more into the gray. Not that I think the author of this quiz was functioning based on such nuance, but it's possible I suppose.